When Nate and Frey got home Marc and Melissa were having moments where she would act like an airhead while Marc tells her not to do that, as Frey watched she says that their are not a better couple then her and Nate. The guys were surprised from what they heard and Melissa took it pretty hard. you're calculations are wrong fray tell it to the fanservice, deviantart, and the artist himself who made you characters, right sky! 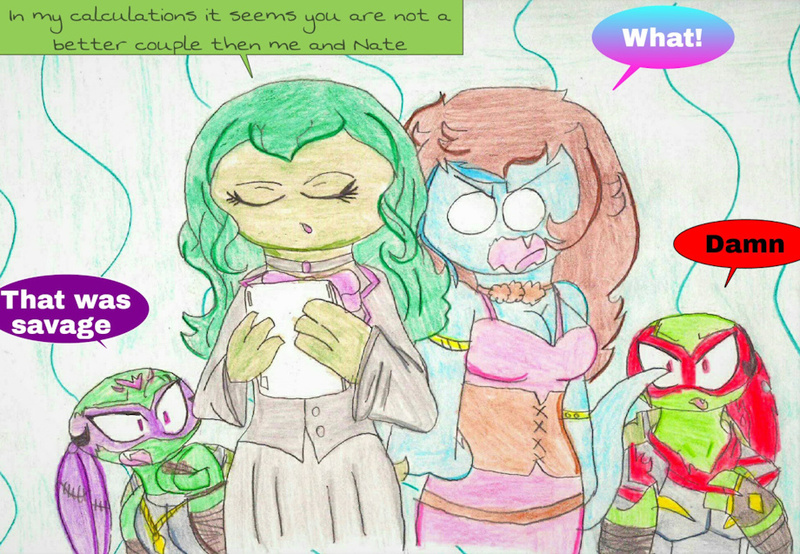 Tough, Nate been i love with her since she was a human and since she became a turtle he's been with her still ever since even confronted her family about the issue. She has look of someone who is tired or unemotional but inside she would cry if anything would happen to Nate.